Mobile commerce is becoming a mainstream way for consumers to shop for products and services online. This is especially true for e-commerce sales in the US, where the biggest mobile commerce companies are expected to collectively reach $155.164 billion in mobile sales by the end of 2015. The increase in mobile shopping is leading more US retailers to invest in mobile apps. Many global online businesses are also getting comfortable moving more and more of their activities to mobile platforms because unlike mobile-optimized websites, smartphones and tablets open a whole new dimension of real-time, efficient interaction with clients. While still relatively new, the market for mobile commerce applications is expected to see steady growth. eBay’s mobile application has already been downloaded by more than 50 million people worldwide, representing 190 countries, and has been localised in eight languages. Let’s imagine you decided to develop an app for an intermediary e-marketplace where you as an independent party coordinate the relationship between sellers and buyers. How much does it cost to create a mobile application like eBay or Amazon? Shopping app development costs depend on the product’s features. We could’ve taken a mobile application like eBay and simply calculated hours needed for its development, but we’d rather help you make a decision that will most likely bring you revenue, and only after that we will tell you the price. Let’s start with the SWOT analysis. Analysis of competitors can be focused on a particular country, a particular continent, or be focused on the global competition. There is not much point in focusing your app strategy on trying to compete directly with e-commerce giants like Amazon. It is generally better to develop an app with several key functions and a simple but attractive user interface and then test it out to see how it works for your business. This is why in our example analysis we decided to concentrate on niche e-marketplace apps. 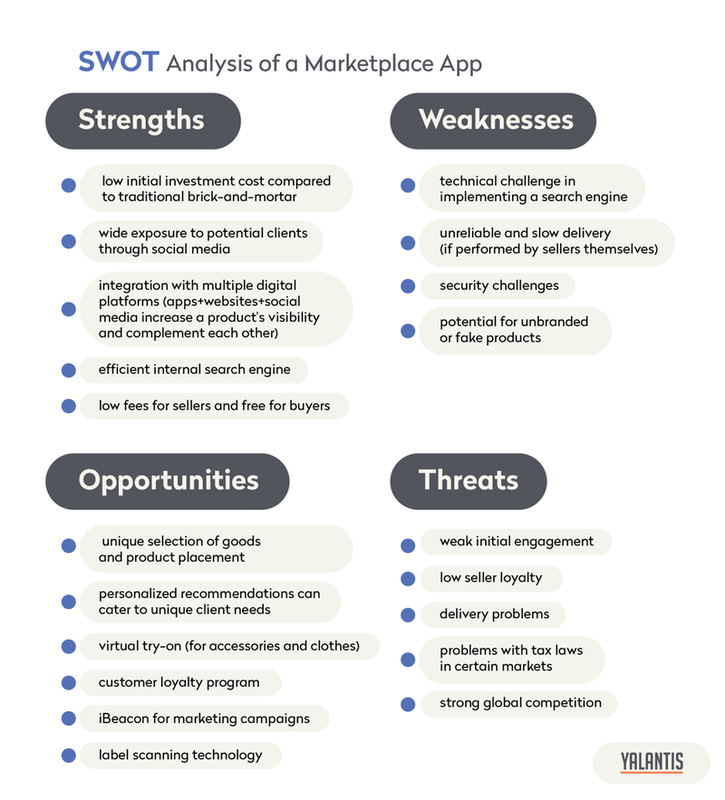 Using our SWOT analysis you can come up with a list of features that will make your app successful and profitable. In our SWOT analysis we tried to concentrate on major factors that can predict an app’s success or failure. As you can see, unique selection of goods, the use of innovative technologies, and customer loyalty programs are opportunities that you can use to make the most of your shopping app. The next step after analysing the market of e-commerce apps and marketplaces is creating a product definition or a value proposition. On the mobile commerce landscape it’s hard to make a difference, because all major product features are pretty much the same between your and your competitors’ app. But you can always win by offering small value-adds or something that could be attractive to some buyers. This can be free shipping, next day shipping, free bonus with a purchase, money-back guarantee, a discounted price, customizable, free product listing for sellers, and other small add-ons. Before you settle on a particular type of app you need to work on establishing your priorities and determining what you expect from the app. This is when you have to consider different KPIs or key performance indicators. Choosing which indicator is a priority for your project will define design and major features of your marketplace app. One of the most important KPI for apps is lifetime value. Other significant indicators include retention rate and number of active users, session length and average revenue. 1.Retention rate – how many clients come back to use your app again and again? Push notifications that deliver targeted and context-aware messages are great for increasing user retention metrics. Push notifications can remind customers when they have items sitting in their shopping carts. You can send a notification reminding users to complete a purchase or incentivize them with a discount – all through push notifications. For better retention, your e-marketplace app can also take advantage of iBeacon technology. 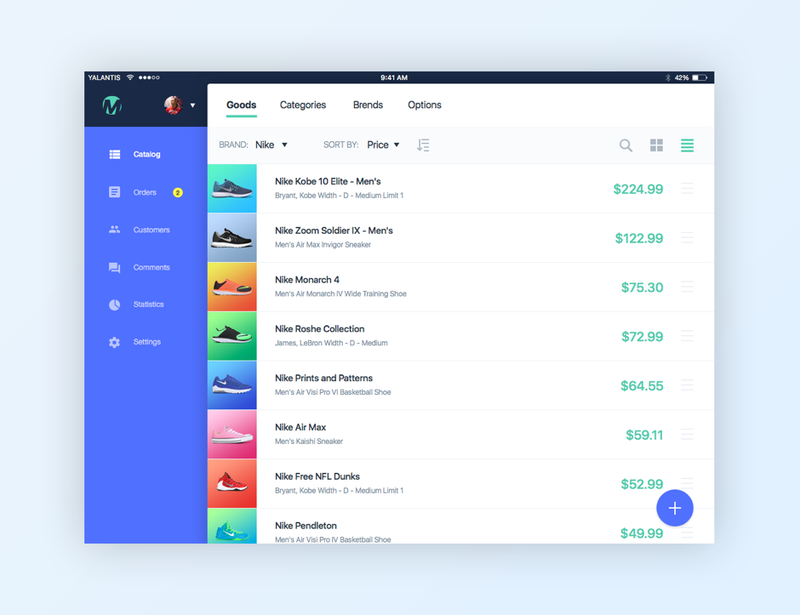 When a user walked into a store, you can send them a notification that an item currently in their wishlist is in-stock in that particular store. However, using iBeacon can only be possible if your marketplace app works with brick-and-mortar retailers. session length – how much time does a user spend in your app? conversion – the percentage of visits that result in goal conversions or e-commerce transactions. 1) Style Boards. Creating looks and expressing styles with style boards and collections is fun and engaging. Style boards can potentially lead users to purchasing decisions. The Polyvore app, for example, offers users an opportunity to create beautiful collages of fashion items they find in the app and share their creations with the fashion community. While searching for fashion items to complete their style boards, users can come across several items they will actually want to buy. Here is an article about style advice app development. 2) Trendsetter badges. You can reward your users with badges based on their engagement. A badge can be achieved when a user collects a certain number of points by gaining followers, inviting friends, liking products, and buying goods. For some users, a desire to become a trendsetter can be so tempting that they might even want to buy some points to get the trendsetter badge in the app. 3) Virtual try on. By letting users create an avatar with their body type to try on different clothing items from fashion retailers you can dramatically increase user engagement. 3. Revenue – how much money does your app make? There are two possible revenue models that an m-commerce app can use: 1) affiliate revenue model where an app receives commissions for referring customers to others resources on the Internet or for referring customers to other apps; 2) transaction fee revenue model where an app receives a commision from every transaction. Insertion fee – when a new item is listed on the app, there is a small non-refundable fee that is charged. Promotional fees – certain items are listed higher on the page to attract more attention. Commission – a fee that the seller has to pay at the end of the auction. In our opinion a transaction fee revenue model is the most convenient for an e-marketplace app, but you can always combine it with elements of other models to make sure that your revenue does not drop rapidly if one strategy is temporarily less profitable than others. The best way to increase revenue in any shopping app is by providing tangible rewards like gift cards or discounts. You can let users collect points which they can use to redeem discounts for products they like most. eBay, for example, uses so-called eBay Bucks – rewards similar to gift cards. Bucks can expire and this motivates users to use them before the expiration day arrives. In addition to that, people who redeem eBay Bucks will almost always add more money to get what they really want. They are also less likely to negotiate a lower price because it's not "their" money they are spending. To learn more, check out our article about the most important KPIs for mobile apps. Now we’ve finally come to the point where we estimate the cost of a shopping app development. We made you read about the SWOT analysis, product definition and KPIs only to help you take the right approach to the product development. After all, we develop apps every day at Yalantis and know that without a through planning and evaluation there is a little to no chance to succeed on a highly competitive mobile commerce market. We decided to take Etsy as an example of a marketplace app that you can learn a lot from. Etsy is an antidote to mass manufacturing. Its value proposition are unique handmade items, vintage goods and craft supplies – products that are hard to find anywhere else. The primary reason a customer buys from the Etsy app is curated and emotive experience that the company managed to create. In our estimate we considered Android app design and development and API design and development. We only look at the cost of a buyer's app here; usually apps for sellers are built on the existing platform of e-commerce web applications. The cost will depend directly on the number of hours developers spend working on the app, but the hourly rates depend on a particular company. Create a basic app and test it to get initial feedback. Here are some key elements for an e-marketplace app that you should concentrate on initially: a simple and memorable UI with a recognizable logo, essential filters, layout, and a user-friendly and secure checkout with a shopping cart. Once you have established which features are most desirable and profitable, then expand them. Optimize your search engines to keep essential information easily available. SEO is equally important for search inside of the app (optimising the search results with the help of different filters) and on the Internet. Make sure to provide a clear and detailed description of your app and optimise your keywords. Engage customers with a loyalty program and keep it simple: customers prefer to get a discount with fewer steps. Work on your customer support. Include a detailed form for complaints and suggestions and be prepared to respond promptly when you receive complaints. How do you develop a personal shopping assistant app powered by data intelligence? How much does it cost to design a mobile application?